Invoke your inner Thoreau with the Nature Walk Journal–the ideal companion for bringing with you as you wander through the woods, take a hike, or appreciate the great outdoors. 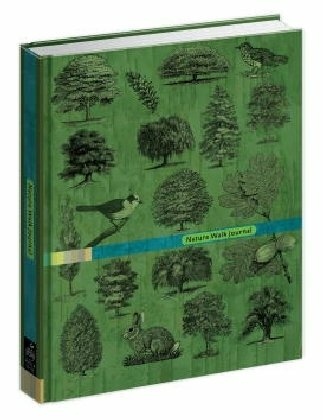 Filled with illustrations of leaves, cloud formations, and animal tracks for easy reference, as well as lists of national parks, scenic trails, and botanical gardens, this journal provides an ideal place to jot down what you see, hear, smell, and notice on your walk. Use the pages for pressing wildflowers, pasting in photos, or making sketches of the scenery, flowers, or animals. Quotes about the woods, wilderness, and nature from writers and artists appear throughout.